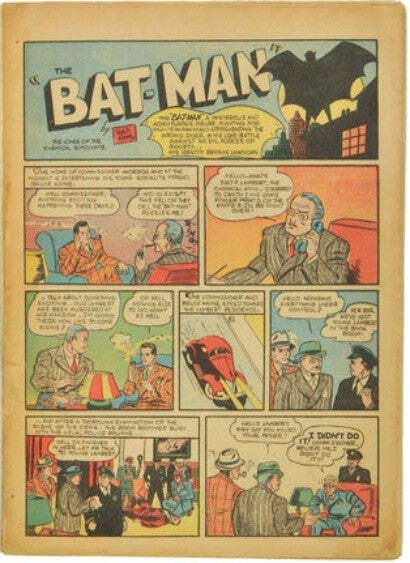 Among the rare and collectible comics auctioning in the Cotswolds, South Cerney (a rural area of "outstanding natural beauty") is a 1939 edition of Detective Comics #27, believed to be one of just 150 examples left in the world. 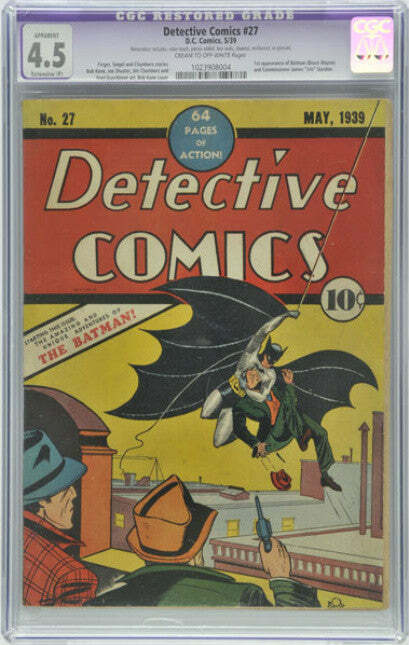 The sale follows the headline-grabbing $1.075m sale of Detective Comics #27 at Heritage Auction Galleries, earlier this year, setting a World Record price for a comic. The piece - featuring The Batman's first ever solo appearance - was graded 8.0 and unrestored, hence its outstanding value. Dominic Winter's Detective Comics #27 has a lower grading than Heritage's offering, "apparently 4.5 (very good-plus)" with "restored, cream to off-white pages." This edition has also been professionally restored, including colour touch, tear seals, a clean and a re-gloss. The 4.5 quality Detective Comics #27 is auctioning with an £20,000-25,000 (nearly $39,404) pre-sale estimate. Whether this estimate proves realistic, or provokes competitive bidding with its relative lowness in comparison to the $1.075m sale, remains to be seen. The result of Dominic Winter's sale Detective Comics #27 will likely give a fascinating insight into the impact of quality on this rare comic's market value. According to a statement released by the auction house, it's hoped that the sale will attract collectors and alternative investors from around the world. Other comics in the 198-strong private collection from a British collector include rare copies and many favourite superheroes. Among them is the first issue of Superman, estimated to fetch up to £15,000, a first edition of the Amazing Spiderman and one of Daredevil. Daredevil was recently named one of Empire's 50 greatest comic book characters, and will likely attract much attention at the Cotswolds sale.